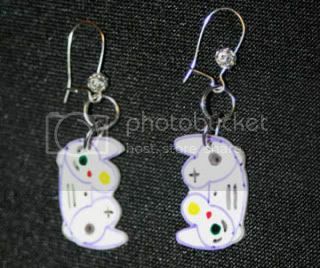 Craftster Community > JEWELRY AND TRINKETS > Trinkets and Jewelry: Completed Projects: General (Moderators: I Sew Cute, Mistress Jennie) > GameCube Controller Earrings + Fun Discovery! GameCube Controller Earrings + Fun Discovery! I've been commenting for a while, but this is my first thread. I used Shrinky Dink to make these GameCube controller earrings for a friend. Thanks! I just gave them to my friend at dinner and she put them right on. You can't get a better sign of appreciation than that. I want some now! I own a GameCube too! Those are so cute! Wow very cute! What I would give to be able to draw! Hope you friend liked them! Thanks so much for your kind comments. My friend loved them! You can use SHARPIES on shrinky dinks??? You're seirous, right? Sharpies will work?